Northeast Frontier Railway Recruitment 2018 : Hello everyone. We are back with another central government job this time. Yes ! As a leading Job portal of Assam , our Assam Career team is dedicated to provide you job updates in time. In this post we will be talking about NFR vacancies that is Northeast Frontier Railway Recruitment 2018 which is declared recently. The Northeast Frontier Railway (abbreviated NFR and पूसीरे), is one of the 17 railway zones in India. Headquartered in Maligaon, Guwahati in the state of Assam, it is responsible for rail operations in the entire Northeast and parts of West Bengal and Bihar. Getting a Job in NFR will definitely a big achievement in your life. 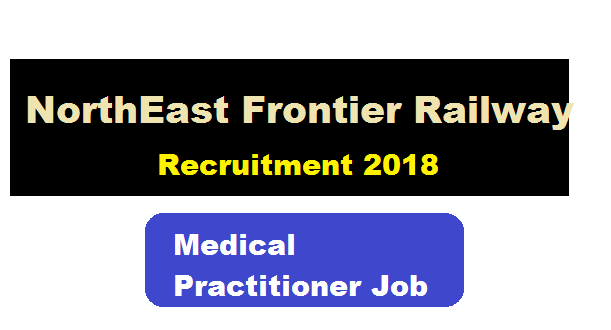 According to the latest North East Frontier Recruitment 2018, A walk -in interview will be held at the office of the Chief Medical Superintendent , Alipurduar Division , NF Railway for filling up 4 nos of Contractual Medical Practitioner posts. We shall discuss more details about this railway vacancy below. Following are the details of the post under Northeast Frontier Railway Recruitment 2018 with required qualification, age limit, salary and all. 1. Name of Hospital/HU: Divisional Railway Hospital/Alipurduar Jn. a) Specialist : The candidate should possess MBBS with Post Graduate Degree/Diploma in respective subject/field as a specialist and should be registered with Indian Medical Council. The willing eligible candidates should report for the “WALK-IN-INTERVIEW” in the office of the CHIEF MEDICAL SUPERINTENDENT, N.F. RAILWAY, ALIPURDUAR JUNCTION-736123 ON 29-06-2018 at 10.00 hrs with copies of all certificates & testimonials IN ORIGINAL and attested true copies and also two passport size photographs. 1/ The appointment will be on Full Time Contract basis for a period not exceeding one year or till replaced by UPSC selected doctors, whichever is earlier, for the specified STATIONS only. 2/ The Contract shall be liable to be terminated by giving 15 days notice by either side, without assigning any reasons, or if the Contract Medical Practitioner is mentally/physically incapacitated. 3/ The Contract appointment shall not confer any right for regularization or absorption in the post. 4/ The number of annual terms for engagement of CMPs is enhanced from the 10 terms to 12 terms on year to year basis or till attaining the age of 60 years whichever is earlier and each terms of engagement shall not exceed more than one year. 5/ A candidate should not exceed 60 years of age as on 01.06.2018. 6. The Contract Medical Practitioner shall produce certificates of his/her character and antecedents from two gazetted officers of the Central/State Government. 6/ The Contract medical Practitioner shall produce certificates of his/her character and antecedents from two gazetted officers of the central or state government. The fee indicated against each is subject to the condition that no Govt. accommodation is provided. If Govt. accommodation is provided, an amount equivalent to the sum of HRA & license fee of the accommodation so provided will be deducted from the monthly remuneration. 8/ If required Specialists are not available, administration will have the liberty to select suitable GDMOs against Specialist vacancies. 9/ The appointment will be on Full time Contract basis for a period not exceeding one year or till the regular incumbent joins or attains the age of 65 years whichever is earlier. 10/ The Contract appointment shall not confer any claim or right for continuity in service or automatic extension of the terms of contract. 11/. A candidate should not exceed 65 years of age as on 01.06.2018. 13/ For retired Govt. Medical Officer the number of terms of engagement is 05 in Indian Railway subject to the age limit of 65 years. **Share the post with your Loved one’s..